Maine BEAR Basics - Does Bait Increase Bear Numbers? Does Bait Increase Bear Numbers? Bears consume up to 27,000 calories per day during their fall feeding frenzy (referred to as hyperphagia), to put on fat for hibernation. They forage continuously throughout the day and night, on natural foods that are often in great abundance at this time of year. Yes, some do visit bait sites for a quick snack that is high in carbohydrates - because, for a bear, getting fat is the healthy thing to do in the fall. But let’s do the math. The quantity of bait that is provided each year by bear hunters is wildly inflated by Mainers for Fair Bear Hunting. Even the 7 million pounds they claim is used would only satisfy the caloric needs of our population of over 30,000 bears for about four days. It amounts to less than 3 ounces per acre of bear habitat. That’s one donut an acre! It is ludicrous to believe that this has any measurable effect on the birth numbers and survival of cubs. A recent National Geographic show stated that a female bear needs to store close to 4 million calories in the form of fat to successfully give birth to and raise cubs. They’re not going to get that from bait! It is equally absurd to criticize our failure to study this fantasy. We don’t study this for a good reason: In Maine’s Bear Study Project we have never seen any evidence that it has a significant influence on the addition of more bears into the population. We don’t spend our limited funds researching these alleged effects for the same reason Texas Parks and Wildlife doesn’t study the chupacabra … it doesn’t exist. Our 40 years of research shows us that natural food is clearly the dominant factor determining reproductive success or failure of bears in Maine. We handle about 200 bears in their dens each winter, among other things monitoring the weight of yearlings. Does bait make a difference during the real hunger years, when natural food crops largely fail? Not according to our research. During good natural food years, yearlings average as high as 55 lbs., but during poor natural food years they average as low as 27 lbs. Baiting remained fairly consistent during this time. So bait is obviously not even remotely a factor in bear nutrition – or reproduction. The worst response to a poor natural food year we have seen was in 1995, when most of our cubs in our northern Maine study area died before 18 months old. Because food was so scarce, most of our radio-collared females were in their dens by mid-September, during the 1995 bait season, at a time when the North Maine Woods had 20% more bait sites on their portion of bear range than they do now. All that bait didn’t stop the bears from denning early – and it didn’t prevent the deaths of all those young bears. Bears mate in June and July, so the number of cubs that are to be born to adult females each winter is determined long before bait is placed in the woods. Female bears are already pregnant when baiting begins, so it is not physically possible for the number of offspring to be influenced by hunter baits. 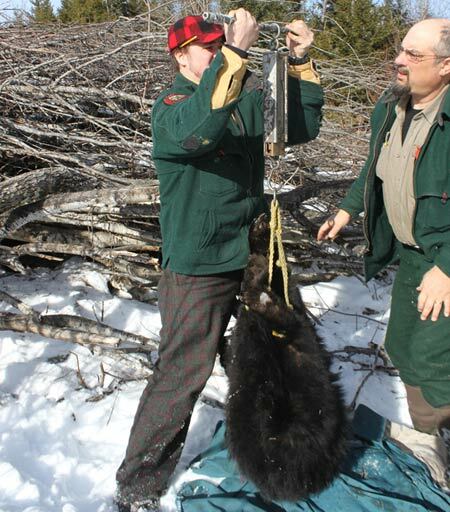 Weighing a tranquilized yearling bear at a winter den, during Maine’s Bear Study project. Careful monitoring of the weights of over 100 yearlings annually shows bait has absolutely no effect on bear size or reproduction. MDIFW photo. 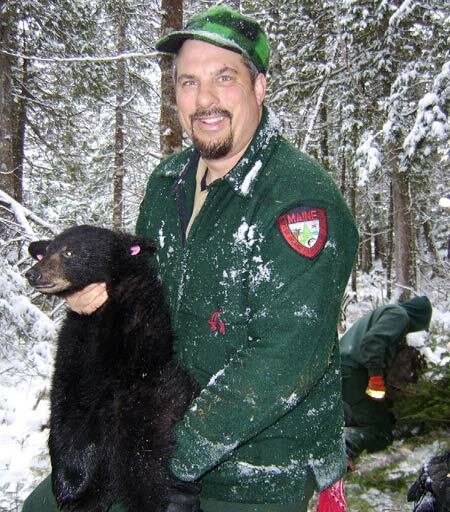 Randy Cross with a healthy yearling bear from a winter den. Annual yearling weights depend completely on natural food availability, not bait. MDIFW photo. Does bear bait increase bear numbers? The answer is an unequivocal no. Actually, the converse is true: Eliminating bait, the main tool for managing Maine’s bear population, will increase bear numbers. having personally handled over 8,000 captures.